Introduction: Lipoproteins are large complexes of molecules that transport lipids (primarily triglycerides and cholesterols) through the blood. Apolipoproteins are proteins on the surface of the lipoprotein complex that bind to specific enzymes or transport proteins on the cell membranes. This directs the lipoprotein to the proper site of metabolism. The major classifications of lipoproteins are, in order of decreasing protein content, high density lipoproteins (HDL), low density lipoproteins (LDL), very low density lipoproteins (VLDL), and chylomicrons. Apolipoprotein AI (ApoAI) is synthesised in the liver and small intestine and is the major Apolioprotein of HDL. It accelerates reverse cholesterol transport and may be protective against the development of atherosclerosis. Average serum levels of Apo AI are 1.27 g/L and 1.46 g/L for men and women respectively. Apolipoprotein AI consists of a single polypeptide chain with a molecular weight of 28 kDa. Human ApoAII encodes the second most abundant protein of HDL particles, where it influences plasma levels of free fatty acids (FFA).Human ApoAIV may have a role in chylomicrons and VLDL secretion and catabolism. It is required for efficient activation of lipoprotein lipase by ApoC-II and a potent activator of LCAT. 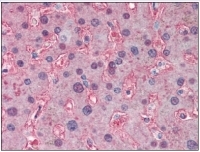 ApoAIV is a major component of HDL and chylomicrons. Cat.-No. 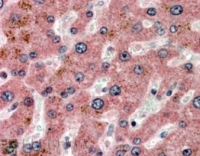 R1029P Apolipoprotein AI antibody staining of Paraffin-Embedded Human Liver. Cat.-No. 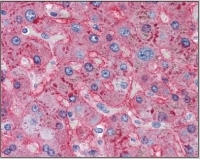 R1031P Apolipoprotein AII antibody staining of Paraffin-Embedded Human Adrenal at 5 µg/ml. Cat.-No. 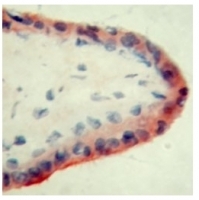 AP16668PU-N APOA4 antibody staining of Paraffin Embedded Human Intestine at 2 µg/ml. Steamed antigen retrieval with citrate buffer pH 6, HRP-staining. 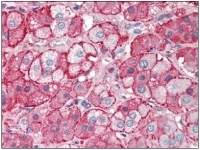 Apolipoprotein B (ApoB) consists of a single polypeptide chain with a molecular weight of 549 kDa and is mostly synthesised in the liver. It is a major apolipoprotein of VLDL, intermediate density and LDL. Apolipoprotein B is a ligand for the LDL receptor and elevated levels are associated with premature atherosclerosis. Normal plasma Apo B levels are around 0.8 g/L. Apolipoprotein CI (ApoCI) functions as a cofactor for LCAT (lecithin-cholesterol acyltransferase), the enzyme responsible for most plasma cholesterol esterification. Elevated serum levels of Apo CI are associated with Types I, III, IV, and V Hyperlipoproteinemia. Cat.-No. 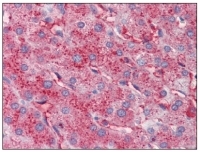 AP16949PU-N Apolipoprotein CI antibody Staining of Paraffin Embedded Human Liver at 3.8 µg/ml. Steamed antigen retrieval with citrate buffer pH 6, AP-staining. Apolipoprotein CII (ApoCII) is in found in chylomicrons and VLDL. Apo CII activates the enzyme that breaks down chylomicron and VLDL molecules. Decreased serum levels of ApoCII, a cofactor for lipoprotein lipase (LPL), have been associated with Hypoalphalipoproteinemia, Nephrotic Syndrome, and Tangier Disease, while elevated serum levels are often present in Types I, III, IV, and V Hyperlipoproteinemia. Apolipoprotein CIII (ApoCIII) is a 79 amino acids long glycoprotein that is synthesized predominantly in the liver and to a lesser degree in the intestine. It is present on VLDLs and chylomicron remnants; and to some extent on HDLs. Apo CIII is a cofactor for sphingomyelinase, an inhibitor of LPL and may activate LCAT. Individuals with a combined hereditary deficiency of both ApoAI and ApoCIII are predisposed to coronary heart disease. Cat.-No. R1035P APOC3 antibody staining of Formalin-Fixed, Paraffin-Embedded Human Liver followed by biotinylated anti-Goat IgG secondary antibody, Alkaline Phosphatase-Streptavidin and Chromogen. Apolipoprotein E (ApoE) is a protein component of plasma lipoproteins that mediates the binding, internalization and catabolism of lipoprotein particles. It can serve as a ligand for several lipoprotein receptors, including the LDL (ApoB/E) receptor and the hepatic ApoE (chylomicron remnant) receptor. Apo E is produced in most organs and occurs in all plasma lipoprotein fractions, constituting 10-20% of VLDL and 1-2% of HDL. Three major isoforms of ApoE have been described in human (E2, E3 and E4) which differ by only one or two amino acids. Estrogen receptor has been shown to upregulate ApoE gene expression via the ERa-mediated pathway, indicating a potential role for ApoE in atherosclerosis. This is consistent with studies in mice in which plasma ApoE levels were raised, thereby protecting the mice from diet-induced atherosclerosis. ApoE has also been shown to be a potent inhibitor of proliferation and thus may play a role in angiogenesis, tumor cell growth and metastasis. Cat.-No. 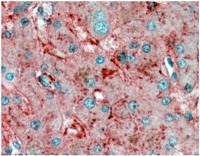 AP16344PU-N APOE antibody staining of Paraffin Embedded Human Liver at 2.5 µg/ml. Steamed antigen retrieval with citrate buffer pH 6, AP-staining. The human Apolipoprotein H (ApoH) molecule, also known as beta 2 glycoprotein 1, is expressed by placental trophoblast cells at high levels. Although the normal physiological role is not known, the protein appears to act as a co-factor for the binding of autoantibodies to phospholipids to trophoblasts, which is a process involved in the pathogensis of recurrent miscarriage (antiphospholipidsyndrome). Cat.-No. 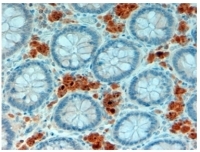 SM1813 Apolipoprotein H antibody staining of Human 8.6 week placenta by Immunohistochemistry on Frozen Sections. Apolipoprotein J (Clusterin) is a secreted glycoprotein found in many biological fluids. It is believed to protect cell membranes from damage, to participate in wound-repair processes, and its expression might be related to tissue remodeling after cell death. Clusterin is found in many organs, elevated levels are found in the CNS under some neuropathological conditions, such as Alzheimer\'s disease, where it is associated with amyloid-ß plaques. Immunohistochemistry: Cat.-No. 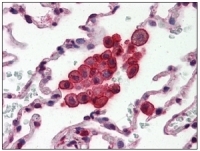 AM09004PU-N Clusterin antibody staining of Formalin-Fixed, Paraffin-Embedded Human Lung at 10 µg/ml followed by biotinylated anti-Mouse IgG secondary antibody, Alkaline Phosphatase-Streptavidin and chromogen. OriGene Technologies offers a broad panel of monoclonal and polyclonal antibodies to various apolipoproteins from Apo AI through Apo J. These antibodies are suitable for immunological detection methods like Western blotting, immunohistochemistry, immunoprecipitation or ELISA. Davidson WS, Thompson TB. The structure of apolipoprotein A-I in high density lipoproteins. J Biol Chem. 2007 Aug 3;282(31):22249-53.
van der Steeg WA, Boekholdt SM, Stein EA, El-Harchaoui K, Stroes ES, Sandhu MS, Wareham NJ, Jukema JW, Luben R, Zwinderman AH, Kastelein JJ, Khaw KT. Role of the apolipoprotein B-apolipoprotein A-I ratio in cardiovascular risk assessment: a case-control analysis in EPIC-Norfolk. Ann Intern Med. 2007 May 1;146(9):640-8. Dorfmeister B, Cooper JA, Stephens JW, Ireland H, Hurel SJ, Humphries SE, Talmud PJ. The effect of APOA5 and APOC3 variants on lipid parameters in European Whites, Indian Asians and Afro-Caribbeans with type 2 diabetes. Biochim Biophys Acta. 2007 Mar;1772(3):355-63. Epub 2006 Dec 5. Grönroos P, Raitakari OT, Kähönen M, Hutri-Kähönen N, Marniemi J, Viikari J, Lehtimäki T. Influence of apolipoprotein E polymorphism on serum lipid and lipoprotein changes: a 21-year follow-up study from childhood to adulthood. The Cardiovascular Risk in Young Finns Study. : Clin Chem Lab Med. 2007;45(5):592-8. Andersen CL, Schepeler T, Thorsen K, Birkenkamp-Demtröder K, Mansilla F, Aaltonen LA, Laurberg S, Orntoft TF. Clusterin expression in normal mucosa and colorectal cancer. Mol Cell Proteomics. 2007 Jun;6(6):1039-48.